Dual pull-pin adjustments on the cross-beam support (9000 lbs. load strength). Welded knurled zinc plated multi-grip pull-up station. 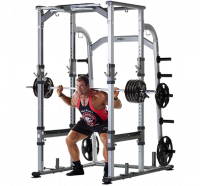 Stainless steel bar hooks on the front and back uprights allow user to face in either direction to perform the exercise. A good fit. High function. Member engagement. And where it all comes together is Connexus.